The body’s reaction to infections involves the orchestration of multiple systems to effectively initiate, execute and resolve the immune response. At the core of these adaptive processes are the cellular and molecular neural, immune and endocrine interactions that begin with the central nervous system recognizing the presence of an infection. The mediator prostaglandin E2 (PGE2) plays key roles as immune messenger between the cells in brain’s microvasculature and the neuroendocrine system. The chain reaction that follows will mobilize the body’s immune resources and ultimately be resolved by the release of anti-inflammatory signals, most important of which is the release of glucocorticoids by the adrenals. This review will summarize the current understanding of the role of PGE2 signaling in the brain during systemic infections, focusing on its role in mediating the release of neuroendocrine signals that act as negative feedback on the immune response. During infections, immune mediators (pathogen particles, cytokines, etc.) can reach the brain through the blood stream and impact on different neuronal circuits via cognate receptors present on the cells forming the blood-brain barrier (BBB) and the circumventricular organs (CVOs, the ‘leaky’ structures of the BBB). Central to the recognition of pathogens are the Toll-like receptors (TLRs), which can directly recognize foreign microbial particles. The TLRs are present on and can activate the endothelial cells and perivascular cells (PVCs, a subset of brain macrophages) that make up the BBB. These activated cells release prostaglandin of the E2 type (PGE2), initiating the neuro-endocrine pathways involved in restoring homeostasis and providing negative feedback to innate immunity. The immune-suppressing glucocorticoids (GCs), secreted by the adrenals, are vital to the survival of the host in the presence of pathogens. This review offers an in-depth look at the molecular details (including the emerging role of TLRs during inflammation) underlying the influence of circulating immune signals on the central nervous system (CNS), ultimately converging on the synthesis and action of PGE2. Although most of the majors players involved in this cascade are known, the exact mechanisms of actions are still unclear. On this regard, we will revisit the concept of ‘fast and delayed response’ involving the same ligands but different groups of cells, signal transduction pathways, and target genes. Emerging studies supporting and adding to this model in the past 5 years will be discussed. Figure 1. Systemic immune reaction and the hypothalamic-pituitary-adrenal axis. When an immune threat is present in the body, activated monocytes and the proinflammatory cytokines they release travel through the blood, along with pathogen immunologically active particles (termed pathogen associated molecular patterns (PAMPs), and interact with the cells of the brain vasculature. The endothelial cells and the associated perivascular microglia synthesize prostaglandin E2 (PGE2). 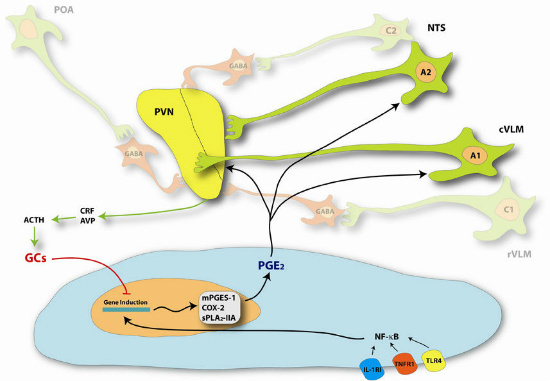 The PGE2 is released in the parenchyma and acts on the corticotropin-releasing factor (CRF)-secreting neurons of the paraventricular nucleus of the hypothalamus (PVN). The CRF enters the circulation and reaches the adenohypophysis part of the pituitary gland and causes the release of adrenocorticotropic hormone (ACTH) into the systemic circulation. ACTH then reaches the adrenal gland and triggers the synthesis and release of glucocorticoids (GCs), which may act as negative feedback on the inflammatory response. A similar response takes place at distal sites that project to the PVN (preoptic area (POA), nucleus of the solitary tract (NTS), ventrolateral nucleus of the medulla [VLM]). Activation of these circuits results in an integrated response to immune stimuli, which are directly under the control of the final product of this neuroendocrine axis, GCs. The immune response to infections involves a multi-system cellular and molecular response (Fig.1). The initial immune contact with pathogens is usually through dendritic cells and macrophages. These cells process antigens and become the primary antigen-presenting cells (APCs) of the body. The APCs interact with specific molecular patterns found in microbes through cognate receptors expressed on their surface. These patterns can be found in structural components of pathogens such as lipopolysaccharide (LPS), present in the cell wall of gram-negative bacteria, and in many other molecules of gram-positive bacteria, fungi, viruses, and other microorganisms. The receptors for these pathogen-associated molecular patterns (PAMPs) are known as pattern recognition receptors (PRRs) [1, 2]. The PRRs are involved in the release of inflammatory mediators by APCs in response to PAMPs. Studies in the past decade have led to the emergence of TLRs, which are prototypical PRRs. It is estimated that humans have over 10 different TLRs, while other TLRs are also characterized in other mammals as well as fish. 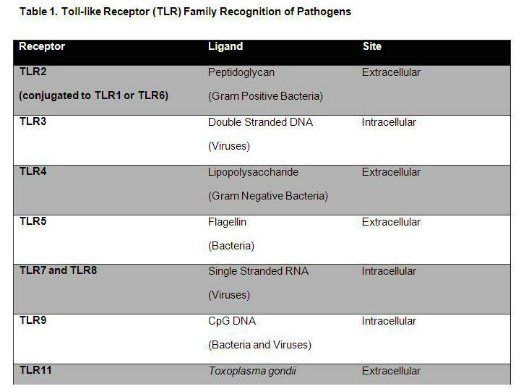 Peptidoglycan and lipoteichoic acid from gram-positive bacteria are recognized by TLR2 conjugated to TLR6 or TLR1, double-stranded RNA viruses are recognized by TLR3, LPS from gram-negative bacteria binds to TLR4, flagellin to TLR5, and CpG bacterial and viral DNA triggers signaling via TLR9 [3-5]. Single-stranded RNAs from viruses (e.g., HIV-1 and influenza) are now believed to be the physiological ligands for TLR7 and TLR8 [6, 7], whereas TLR11 is activated by Toxoplasma gondii . It is also believed that TLR1, 2, 4, 5, 6, and 11 recognize extracellular PAMPs, whereas TLR3, 7, 8, and 9 are sensors for intracellular PAMPs (e.g., CpG DNA, ssRNA, and dsRNA). TLRs can also recognize host molecules and bind metal particles (such as nickel ), but these discussions are beyond the scope of this review (see Table 1). In the laboratory, the endotoxin LPS is the most frequently used and most powerful stimulus to trigger the signaling pathways involved in innate immunity. The recognition of LPS involves its binding to membrane receptor CD14, which transfers LPS to TLR4 . The involvement of TLR4 in LPS recognition was substantially accepted because of the identification of a missense mutation in the lps locus in the C3H/HeJ mouse strain, which is largely insensitive to LPS  but not to cell wall components derived from gram positive bacteria (recognized by TLR2) . This locus was later found to correspond to TLR4. The activation of TLR4 and all other TLRs initiates sequential intracellular signal steps similar to those of the proinflammatory cytokine IL-1beta. This is mostly because of similarities between TLR4 and the IL-1 receptor (IL-1R) in the conserved Toll/IL-1R (TIR) domains. Following the binding of LPS or IL-1beta to their respective receptors, the myeloid differentiation factor 88 (MyD88) is immediately recruited to the TIR domain, initiating a signal transduction cascade, ultimately leading to the release of nuclear factor kappa B (NF-kappaB) from its cytoplasmic inhibitor IkappaB . Details of this cascade are beyond the scope of this review and are addressed elsewhere [14, 15]. Nuclear translocation of NF-kappaB engages the transcription of genes encoding most innate immune proteins, namely cytokines (e.g., IL-1, TNF-alpha, IL-6), chemokines, proteins of the complement system, enzymes, adhesion molecules, and immune response receptors (e.g., CD14, TLR2, IL-6R). A timely controlled production of these proteins is essential for a proper innate immune response and the elimination of pathogens. Proinflammatory cytokines (e.g., IL-1beta and TNF-alpha) act as amplifiers of this innate immune response to further increase cell transmigration and phagocytic properties of APCs. There are concerns on how such a positive autoregulatory loop is controlled and whether it can lead to detrimental consequences if not properly regulated. Fortunately, multiple factors play a role through inhibitory feedback on such a system, the most significant of which is the activation of the hypothalamic-pituitary-adrenal (HPA) axis and the release of GCs by the adrenal gland to suppress TLR and pro-inflammatory cytokine signaling and gene transcription. Because of their lipophilic nature, GCs readily cross the membrane system of the cell and bind to mineralocorticoid (MR or type I) or GC (GR or type II) receptors localized in the cytoplasm. Basal levels of GCs activate only MRs, since they have higher affinity than GRs. The GCs along with their receptor (now activated) move to the nucleus and bind to specific DNA sequences called glucocorticoid response elements (GREs). Activated GRs are able to interfere at numerous levels of the proinflammatory signaling cascades, and many models have been proposed to explain the profound anti-inflammatory action of GCs: (i) repression by a direct action of activated GRs modulating transcription via GRE sites; (ii) induction of GRE-responsive genes that inhibit transcription factor signaling (e.g., IkappaBalpha); (iii) protein-protein interactions, either by inhibition of transcription factor DNA binding or by association with the factor bound to its DNA site; (iv) competition of GRs with NF-kappaB and AP-1 for nuclear co-activators such as CREB-binding protein and p300; and (v) GR effects at the post-transcriptional level, such as mRNA destabilization of proinflammatory genes. GCs have also been shown to interfere with the TLR signaling network through these actions . There is no consensus about the mechanisms that play leading roles in suppressing proinflammatory genes, which underlines the complexity of this system . Since the BBB is quite stringent, circulating pathogens and blood-derived cytokines are unlikely to diffuse into the brain to significantly impact cells deep into the CNS tissue. They must rely on activating cells proximal to the brain’s microvasculature. The following sites of interaction are the likely direct targets of the PAMPS and cytokines: (i) CVOs and other leaky structures; ii) cells forming the BBB; and (iii) a direct nerve connection. CVOs and Other Leaky Structures: The sensorial CVOs contain a rich vascular plexus with specialized arrangements of the blood vessels. The tight junctions normally present between the endothelial cells are shifted in part to the ventricular surface and partly to the boundary between the CVOs and the adjacent structures. This organization promotes the diffusion of large molecules into the perivascular region, making the CVOs privileged target sites not only for cytokines and microbial particles that can gain access through the blood. The CVOs include the vascular organ of the lamina terminalis (OVLT), subfornical organ (SFO), median eminence (ME), and area postrema (AP). The choroid plexus (chp) and leptomeninges are also recognized as being highly vascularized regions and are very sensitive to pathogens through a rapid transcriptional activation of different inflammatory molecules [18-21]. These structures are devoid of neurons and are not CVOs, but they produce inflammatory molecules that could diffuse throughout the CNS via the cerebrospinal fluid (CSF). In the OVLT, circulating inflammatory molecules may reach specific compartments through the fenestrated (porous) capillaries originating from the anterior communicating artery. On the other hand, blood-derived molecules may target specific population(s) of cells of the external lamina via the capillaries of the primary plexus that irrigates the basement membrane of the lower palisade layer of the ME. Both the SFO and AP display extensive networks of capillary loops, and the entire organs are exposed to the blood. These features and the presence of neurons that integrate the autonomic outputs in these CVOs support their role as key structures in mediating the cerebral responses to circulating immunogenic agents. The constitutive expression of immune receptors together with a rapid induction of cellular activity in response to systemic boluses of cytokines and LPS provide evidence that CVOs are routes of entry for immune signals from the bloodstream. The particular distribution of IL-6 messenger RNA (mRNA) and that of other cytokines in the CVOs may also offer some clues in understanding their role within the CNS . The increase of IL-6 synthesis in the OVLT is considered to be a possible initiating mechanism of the thermogenic effects of the bacterial endotoxin LPS. The OVLT is a recognized region involved in the adaptive control of thermoregulation [23, 24]. IL-6 is part of the fever response cascade to LPS , and the firing rate of thermosensitive neurons of the preoptic area can be influenced by IL-6 . Neurons of the OVLT and SFO have direct projections to the paraventricular nucleus (PVN), and those of the AP connect with the nucleus of the nucleus tractus solitarii (NTS), which in turn sends catecholaminergic projections (A2/C2) to the hypothalamic PVN. The PVN is the key integrative nucleus for the autonomic functions and also contains the corticotrophin-releasing factor (CRF) neurons that are responsible for the control of the adenocorticotropic hormone (ACTH) release from the adenohypophysis. Catecholaminergic neurons that project from the NTS (and other areas receiving input from the CVOs) to the CRF-releasing neurons of the PVN have also been found to be responsive to IL-1beta . Thus, the CVOs could be possible sites of action through which pathogens and cytokines may exert their actions on the HPA axis. In this regard, the AP and the adjacent NTS have been shown to play a pivotal role in transducing a circulating IL-1 signal into HPA axis activation by a pathway linking the AP and NTS to CRF neurons of the PVN . Moreover, it has been suggested that the neuroendocrine effects of cytokines may occur by increasing prostaglandin synthesis at the level of the ME . This issue is further developed in the section on cells of the BBB and cyclooxygenase (COX) pathways. Finally, the response wave of proinflammatory cytokine-expressing cells from the CVOs to deeper parenchymal regions may also be involved in these events, although this innate immune reaction takes place essentially within the population of microglial cells, and such a response may not participate in neuronal activity, at least as it relates to the autonomic circuits. These mechanisms are reviewed elsewhere [18, 30]. The BBB and Synthesis of Soluble Mediators: Cells forming the BBB are poised to mediate the flow of immune information from the circulation to the brain parenchyma. Pro-inflammatory cytokines, when secreted by circulating immune cells, trigger a cascade of events leading to signal transduction pathways in vascular-associated cells of the CNS. These cells exhibit both constitutive and induced expression of receptors for proinflammatory ligands that can stimulate mitogen-activated protein (MAP) and NF-kappaB kinases. Depending on the challenges and the cytokines involved, the transduction signal(s) solicited in cells of the BBB may trigger neuronal activity by activating the transcription and production of soluble factors, such as prostaglandins (PGs). During inflammation and CNS trauma, the BBB can be compromised , which can further enhance the inflammatory response in the brain. Biosynthesis of PGs: Prostaglandins are derivatives of arachidonic acid (AA), which is found in abundance in the brain. In response to various challenges, including proinflammatory cytokines and LPS, AA is translocated into the cell cytosol by several phospholipases A2 (PLA2). Cytosolic PLA2 (cPLA2) is modestly upregulated in the hypothalamus following LPS [32, 33]. However, one of the secretory forms of the enzyme, sPLA2-IIA, is strongly upregulated by LPS, specifically in the brain (133-fold increase in the hypothalamus) compared to the increase in the peripheral organs that process LPS (up to a 9-fold increase in the liver) following its administration in rats. The AA released by PLA2 is converted to PGH2 by COXs in a two-step process. First, COX activity adds molecular oxygen to the unsaturated fatty acid AA, generating prostaglandin G2 (PGG2). PGG2 is then converted to PGH2 by the peroxidase activity of the enzyme. Once generated, PGH2 is rapidly converted to prostaglandins (PGD2, PGE2, PGF2α), prostacylin (PGI2), and thromboxane A2 (TxA2) by tissue-specific synthases. Prostaglandin E synthase (PGES) catalyzes conversion of COX-derived PGH2 to PGE2 . Three distinct types of PGES have been characterized in mammals. Cytosolic PGES (cPGES), known as p23, is constitutively and ubiquitously expressed and predominantly converts COX-1-derived PGH2 to PGE2 . Microsomal PGES-1 (mPGES-1) is an inducible perinuclear enzyme that seems to be associated with COX-2. COX-2 and mPGES-1 genes are transcriptionally regulated by NF-kappaB, and both enzymes are essential for the delayed PGE2 synthesis during inflammation . In this regard, mPGES-1 plays a crucial role in immune-induced pyresis and may be a direct target for the treatment of fever and other PGE2-dependent acute-phase reactions elicited by the brain [37, 38]. Finally, glutathione-nonspecific mPGES-2 can be coupled with both COXs and may elicit the production of the PGE2 involved in both tissue homeostasis and disease . The diversity of the tissue-specific synthases and receptors gives rise to a wide range of potential biologic functions for the prostanoids. Prostaglandin G, PGH, PGI, and TxA are chemically unstable and are degraded into inactive products under physiological conditions, with a half-life of 30 seconds to a few minutes. Other PGs, although chemically stable, are metabolized quickly. It is therefore believed that prostanoids work locally, acting only in the vicinity of the site of production to serve as potent autocrine and paracrine mediators in a wide variety of physiological processes. Circulating PAMPs and cytokines have the ability to bind to their cognate receptors expressed on the surface of endothelial and/or monocytic cells lining the BBB, which would then lead to proinflammatory signaling and transcription of the enzymes responsible of the PGE2 formation in the cerebral tissue. It is also possible that alternative pathways involving COX-1, cPGES, and mPGES-2 lead to an early rise in PGE2 levels that would explain the rapid increase in the activity of neurons involved in the control of autonomic functions (see below). It is interesting to note that systemic inflammatory insults induce COX-2 and mPGES in a nonspecific manner across the cerebral blood vessels and small capillaries, whereas the neuronal activity is limited to selective nuclei, including the endocrine hypothalamus. Such a pattern would support the concept that expression of specific PGE2 receptors within parenchymal cells adjacent to the site of production determines the action of the PG in the brain. Along with the alternative pathways, these receptors may also mediate the rapid and delayed responses to immune insults (see below). PGE2 Sites of Action: There are four different receptors for PGE2 (EP1–4). Multiple alternatively spliced isoforms exist for the PGE2 EP3 receptor (EP3α, EP3β, EP3γ). They share common extracellular and membrane-spanning regions but differ in intracellular and carboxy-terminal domains. Each PGE2 receptor is associated with a unique G-protein and consequently a unique second messenger system, namely, elevation of intracellular Ca2+ (EP1) and stimulation (EP2, EP4) or inhibition (EP3) of adenylate cyclase. The distribution of [3H]PGE2-binding sites, presumably PGE2 receptors, was first demonstrated in the monkey diencephalon , which was followed by more detailed analysis of [3H]PGE2-binding sites in rat brain [41, 42]. PGE2 binding sites were located in a number of discrete brain regions, including thalamic and hypothalamic nuclei, hippocampus, central gray, superior colliculus, parabrachial nucleus (PB), locus coeruleus (LC), raphe nuclei, spinal trigeminal nuclei, and NTS. In situ hybridization was thereafter used to determine the exact distribution of each PGE2 receptor subtype. The hypothalamic paraventricular and supraoptic (SON) nuclei exhibited EP1-expressing cells , but a wide distribution was found for the gene encoding the EP3 subtype . A distinct pattern of EP2- and EP4-expressing neurons exists throughout rat brain [45-47]. EP2 receptor mRNA was detected in the bed nucleus of the stria terminalis (BnST), lateral septum (LS), SFO, ventromedial hypothalamic nucleus (VMH), central nucleus of the amygdala (CeA), LC, and AP, whereas EP4 receptor transcript was located mainly in regions involved in the control of neuroendocrine and autonomic activities. Moderate doses of LPS and IL-1beta activate EP4 neurons, and this activation is prevented with COX inhibitors. All four PGE2 EP receptor mRNAs are expressed in the anteromedial preoptic region that plays a crucial role in the febrile response. Among these, only EP4 receptor mRNA is strongly expressed throughout the PGE2-sensitive regions, including the OVLT, ventromedial preoptic nucleus (VmPO), and median preoptic nucleus (MnPO). These EP4-expressing neurons are also activated by systemic inflammation, whereas EP2- and EP3-positive neurons do not respond. EP1 receptor mRNA is present in PGE2-sensitive regions, but its expression level is weak. This would support the theory that EP4 may be the key binding and functional receptor for PGE2 in the brain to activate the circuits involved in the autonomic control. In spite of this, pharmacological and genetic mutation experiments suggest otherwise. Oka and colleagues  used drugs with agonist and antagonist properties for each EP receptor in rats. Intracerebroventricular (i.c.v.) injection of 17-phenyl-omega-trinor-PGE2 (an EP1 and EP3α receptor agonist), but not butaprost, M&B28767, or 11-deoxy-PGE1 (EP2, EP3α, and EP4 receptor agonists, respectively), induced fever, and SC19220 (an EP1 receptor antagonist) prevented the febrile response to PGE2. In a later study, they found that i.c.v. injection of the EP1 agonist ONO-DI-004 and the EP3 agonist ONO-AE-248 both produced hyperthermia, whereas the EP4 agonist ONO-AE1-329 caused a decrease in core body temperature . Another pharmacological study indicated that EP2 or EP3 receptor might be the receptors necessary to produce fever . In mice bearing genetic deletions of the EP1–4 receptors, only EP3-knockout animals failed to show the early phase of fever (up to 1hr) after LPS intravenously (i.v.) or PGE2 i.c.v. . A later study demonstrated that EP1-knockout mice have a blunted fever response to intraperitoneous (i.p.) LPS, and EP3-knockout mice became hypothermic in response to LPS . A further study has confirmed the essential role of EP3 in the MnPO for the generation of a fever response . These studies suggest distinct roles for the receptors in mediating the central thermoregulatory response to PGE2, but the role of the receptors in mediating the central neuroendocrine response have not been discussed. In this regard, a group has shown that both EP1 and EP3 are required for ACTH release in response to LPS and that these two receptors were co-localized with CRF-positive neurons in the PVN . This study was the first to show clear distribution of EP1 in the PVN, NTS, and the CeA (where it plays a crucial role for the activation of the CeA in response to LPS). These data remain somewhat surprising but may be attributable to early and late/delayed responses of this endocrine axis to immune stimuli and the period in which the analysis was performed (see below). It is also important to note that EP4-deficient mice do not survive, and they have to be intercrossed in a different background. It is, therefore, quite difficult to compare them with the other gene-deficient mice, and conditional EP4-knockout mice will be essential to clearly define the role of this receptor in the brain of adult animals. The relative lack of specificity of EP4 antagonists and agonists in the species studied may also explain the pharmacological data. Finally, it is possible that the circuits unraveled by functional indices of neuronal activity participate in more subtle physiological responses, which were masked by the previous experimental designs. 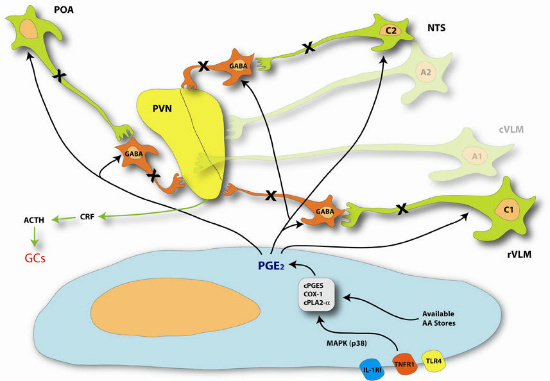 PGE2 production in the brain is initiated when inflammatory ligands (e.g., IL-1beta, TNF-alpha, LPS) bind to their receptors on cells of the brain endothelium or PVCs . This triggers a quick production of PGE2 within the CNS parenchyma, which is ultimately responsible for CRF production by the PVN . Figure 2. Hypothetical model for the fast EP3-dependent PGE2 response in the brain. Circulating inflammatory factors (IL-1, TNF, LPS) bind to their receptors expressed on the surface of endothelial cells / perivascular cells of the brain microvasculature. This leads to a rapid use of available constitutive enzymes (cyclooxygenase (COX)-1, cytosolic phospholipase A2 (cPLA2), cytosolic prostaglandin E synthase (cPGES)) and arachidonic acid (AA) stores to transiently produce and release PGE2 (possibly through MAPK p38 mechanisms). This PGE2 acts on its EP3 receptor on GABAergic afferents to the PVN, which rapidly turns off the inhibition of the corticotropin-releasing factor (CRF)-releasing neurons. A similar scenario may happen at the medial preoptic area (POA), C1 catecholaminergic neurons of the rostral ventrolateral medulla (VLM) and C2 catecholaminergic neurons of the solitary tracts nucleus (NTS), where the binding of PGE2 to the EP3 receptor inhibits excitation of these GABAergic projections of PVN neurons. We had suggested that the production of brain PGE2 occurs via two pathways (Figs. 2 and 3): (i) a fast transient production in endothelial cells and CVOs dependent on activation (possibly through MAPK p38 phosphorylation) of available constitutive PGE2 synthesis enzymes (cPLA2, COX-1, cPGES, mPGES-2). This production would be considered fast since it would be independent of transcription and NF-kappaB activation, and (ii) a slow, sustained PGE2 synthesis in the endothelial cells and PVCs (that are better equipped to respond to cytokines and pathogens) involving the robust induction of the principal enzymes involved in PGE2 synthesis (especially sPLA2-IIA, COX-2, and mPGES-1), which are NF-kappaB–mediated gene products. The slow transcription-mediated response would be massive, but could offer a way through which GCs would then exert their negative feedback on NF-kappaB activity to shut down the CNS production of PGE2. The fast response could be involved in priming the later delayed response and preventing drastic changes to homeostatic processes that the delayed response would have problems overcoming. A study looking at the effects of specific COX-1 and COX-2 inhibitors supports such a role for the COX-1-dependent early response because the ablation of COX-1 activity following LPS administration led to a fast hypothermic response. This response could not be counterbalanced by the later COX-2-dependent fever response , emphasizing the importance of the coordination between the fast and delayed responses. Figure 3. Delayed EP4-dependent PGE2 response in the brain during systemic immune insults. The delayed PGE2 response requires transcription of the inducible enzymes (secretory phospholipase A2 (sPLA2-IIA), cyclooxygenase (COX)-2, microsomal prostaglandin E synthase (mPGES-1) through NF-kappaB–mediated transcriptional mechanisms. These enzymes permit the passive production of PGE2, which acts on the EP4 receptors in the paraventricular nucleus (PVN) and at the adrenergic A1 region of the caudal ventrolateral medulla (cVLM) and A2 region of the nucleus of the solitary tract (NTS) to enhance corticotropin-releasing factor (CRF) and vasopressin (AVP) release into the infundibular system. This leads to corticotroph adrenocorticotropic hormone (ACTH) release and subsequently to biosynthesis and secretion of glucocorticoids (GCs) from the adrenal gland. The latter hormone exerts negative feedback on the transcription of the enzymes responsible for the production of PGE2 and prevents overproduction of inflammatory molecules during innate immunity. The populations of cells containing the enzymes responsible for PGE2 synthesis during systemic inflammation are still debated. Clear evidence that both COX-2 and mPGES-1 transcripts and proteins are expressed essentially within the endothelium of the cerebral capillaries has previously been discussed [58-63]. On the other hand, few studies have shown that PVCs are responsible for delivering PGE2 in response to systemic inflammatory stimuli [64-66]. The action of this prostaglandin may therefore be dependent on its cellular source, the endogenous pool of PGE2 in endothelial cells, and the receptor subtypes expressed on their cellular targets. It has been shown that EP4 is present on the postsynaptic sites of hypothalamic stimulatory neurons, whereas gamma-aminobutyric acid (GABA) neurons contain presynaptic EP3 receptors in their terminals . Activation of both EP3 and EP4 receptors is actually involved for the excitatory regulation of supraoptic neurons by PGE2. We proposed that both receptors contribute to the activation of PVN neurons during systemic inflammation, but at different times. Stimulation of the cPLA2 / COX-1 / cPGES pathway would lead to a rapid secretion of PGE2 from endothelial cells and then cause an immediate activation of the CRF neurons through inhibition of GABA afferents that contain EP3 receptors. The hypothalamic PVN receives robust innervation from GABA neurons critical in the control of the HPA axis during stress [68-73]. Inhibition of GABAergic neurons by EP3 may take place locally at the level of the nerve terminals within the PVN or through distal inhibition of GABA projections originating from different areas, such as the preoptic area (POA), PB, rostral ventrolateral medulla (rVLM), and/or NTS. PGE2 synthesis under the control of the sPLA2-IIA / COX-2 / mPGES-1 pathway would relay this signal and trigger various populations of neurons. Enzymes of this pathway are not constitutively present and have to be induced by the proinflammatory signal transduction pathways. It is also possible that both endothelial and microglial cells contribute to the PGE2 production in the delayed phase. Once secreted, PGE2 would maintain CRF activity via EP4 stimulation either directly or through activation of the A1 and A2 catecholaminergic circuits from the cVLM and NTS, respectively. These mechanisms fit nicely with the hypothesis of fast and delayed PGE2 responses, where the fast phase could be associated with the disinhibition of CRF-releasing neurons of the PVN, without the need for time and energy-hungry transcription. This response could prime the PVN to become more receptive to the massive release of PGE2 by endothelial and PVCs with their newly transcribed PGE2-synthesizing enzymes. In support of this hypothesis is the specific increase in EP4 mRNA levels in CRF neurons and catecholaminergic afferents to PVN following a systemic immune challenge [45, 46]. The sustained release of GCs provides direct inhibitory feedback on these events at the level of transcriptional machinery (see above), which is the most powerful endogenous immunosuppressive mechanism. This innovative dual regulation of PGE2 production and action in the brain could have important implications for an appropriate control of fever, HPA axis, and other autonomic functions. Recently, this hypothesis for a dual role of PGE2 in the brain has been revisited. Evidence has supported the receptor-specific effect of the prostaglandin in the NTS when activated by IL-1beta . A 2008 study set out to delineate the role of PVCs and endothelia in PGE2 in the brain by using chimeric mice either lacking MyD88 (thus, preventing most cytokines and PAMPs to signal the cells) in their PVCs or endothelia. The study demonstrated that PGE2 activity in the endothelial cells of the brain is essential of the activation of neuro-immune signaling in the brain in response to low and high doses of LPS . Serrats and colleagues  have taken the proposed hypothesis of a dual role for prostaglandins a step further; through an elegant method of ablating the PVCs population in the brain, they were able to refine the specific role of PVCs and endothelial cells of the BBB in orchestrating the central response to immune signals. Their proposed model made the PVCs central to a fast, early response to cytokines (in this case, IL-1beta), which actually suppressed endothelial COX signaling. As pathogen-specific molecules reach the brain vasculature (e.g., LPS), the suppressive effect of PVCs on endothelial cells is overturned by massive activation of endothelial cells (most possibly in a TLR4-dependent manner). Since the turn of the millennium, the evolution of our knowledge of immune to brain signaling have taken giant leaps through the use of refined methods of molecular and cellular investigation. The neuro-immune and neuro-endocrine network in the brain is becoming clearer: the elucidation of the roles of endothelial cells and PVCs and the distribution of TLRs and cytokine receptors on these two populations of cells has shed light on a possible mechanism by which the brain can customize its response to various immune insults and offers a tangible explanation for a cytokine-dependent and -independent blood-to-brain signaling cascade. Evidence of the intricacies of PGE2 synthesis and action in the brain not only has helped clarify the importance of this soluble mediator in affecting both neuronal and immune cell function, but has led to the development of many non-steroidal anti-inflammatory drugs (NSAIDs) that target its biosynthetic enzymes [77-79]. The presence of fast and delayed neuro-immune responses offers tremendous clinical implications. For example, when considering the pharmacokinetics of anti-inflammatory drugs, one will have to take under consideration the therapeutic windows, both cellular and temporal, in order to target the right cell population at the right time to get the desired effect. The use of modern techniques such as gene and stem cell therapies will help exploit such concepts and, as our understanding of these systems progresses, help prevent the devastating effects of infections that target the CNS and neuro-inflammatory disorders. The author would like to thank Dr. Umadevi Gangadharan for her assistance in reviewing this manuscript. Antigen-presenting cells (APCs); area postrema (AP); bed nucleus of the stria terminalis (BnST); central nucleus of the amygdala (CeA); choroid plexus (chp); circumventricular organs (CVOs); gamma-aminobutyric acid (GABA); glucocorticoid receptor (GR); glucocorticoid response elements (GREs); lateral septum (LS); lipopolysaccharide (LPS); locus coeruleus (LC); median eminence (ME); median preoptic nucleus (MnPO); mineralocorticoid receptor (MR); mitogen-activated protein (MAP); myeloid differentiation factor 88 (MyD88); nuclear factor kappa B (NF-kappaB); parabrachial nucleus (PB); paraventricular nucleus (PVN); pathogen-associated molecular patterns (PAMPs); pattern recognition receptors (PRRs); perivascular cells (PVCs); phospholipases A2 (PLA2); receptors for PGE2 (EP1–4); preoptic area (POA); rostral ventrolateral medulla (rVLM); subfornical organ (SFO); supraoptic nucleus (SON); thromboxane A2 (TxA2); Toll-like receptors (TLRs); vascular organ of the lamina terminalis (OVLT); ventromedial hypothalamic nucleus (VMH); ventromedial preoptic nucleus (VmPO). NP Turrin – Quality Division, Research, Sheikh Khalifa Medical City, Abu Dhabi, U.A.E. Janeway CA, Jr. How the immune system works to protect the host from infection: a personal view. Proc Natl Acad Sci U S A 2001; 98: 7461-8. Kopp E, Medzhitov R. Recognition of microbial infection by Toll-like receptors. Curr Opin Immunol 2003; 15: 396-401. Underhill DM, Ozinsky A. Toll-like receptors: key mediators of microbe detection. Curr Opin Immunol 2002; 14: 103-10. Beutler B, Hoebe K, Du X, Ulevitch RJ. How we detect microbes and respond to them: the Toll-like receptors and their transducers. J Leukoc Biol 2003; 74: 479-85. Diebold SS, Kaisho T, Hemmi H, Akira S, Reis e Sousa C. Innate antiviral responses by means of TLR7-mediated recognition of single-stranded RNA. Science 2004; 303: 1529-31. Heil F, Hemmi H, Hochrein H, et al. Species-specific recognition of single-stranded RNA via toll-like receptor 7 and 8. Science 2004; 303: 1526-9. Yarovinsky F, Hieny S, Sher A. Recognition of Toxoplasma gondii by TLR11 prevents parasite-induced immunopathology. J Immunol 2008; 181: 8478-84. Schmidt M, Raghavan B, Muller V, et al. Crucial role for human Toll-like receptor 4 in the development of contact allergy to nickel. Nat Immunol; 11: 814-9. Beutler B. Toll-like receptors: how they work and what they do. Curr Opin Hematol 2002; 9: 2-10. Poltorak A, He X, Smirnova I, et al. Defective LPS signaling in C3H/HeJ and C57BL/10ScCr mice: mutations in Tlr4 gene. Science 1998; 282: 2085-8. Hoshino K, Takeuchi O, Kawai T, et al. Cutting edge: Toll-like receptor 4 (TLR4)-deficient mice are hyporesponsive to lipopolysaccharide: evidence for TLR4 as the Lps gene product. J Immunol 1999; 162: 3749-52. Takeda K, Kaisho T, Akira S. Toll-like receptors. Annu Rev Immunol 2003; 21: 335-76. Ghosh S, Karin M. Missing pieces in the NF-kappaB puzzle. Cell 2002; 109 Suppl: S81-96. Jones BW, Means TK, Heldwein KA, Keen MA, Hill PJ, Belisle JT, Fenton MJ. Different Toll-like receptor agonists induce distinct macrophage responses. J Leukoc Biol 2001; 69: 1036-44. Chinenov Y, Rogatsky I. Glucocorticoids and the innate immune system: crosstalk with the toll-like receptor signaling network. Mol Cell Endocrinol 2007; 275: 30-42. De Bosscher K, Vanden Berghe W, Haegeman G. The interplay between the glucocorticoid receptor and nuclear factor-kappaB or activator protein-1: molecular mechanisms for gene repression. Endocr Rev 2003; 24: 488-522. Nguyen MD, Julien JP, Rivest S. Innate immunity: the missing link in neuroprotection and neurodegeneration? Nat Rev Neurosci 2002; 3: 216-27. 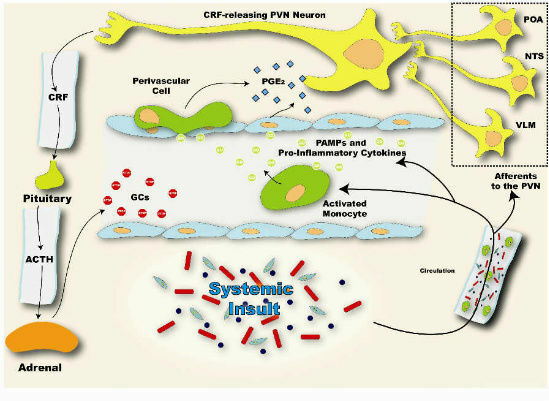 Nadeau S, Rivest S. Role of microglial-derived tumor necrosis factor in mediating CD14 transcription and nuclear factor kappa B activity in the brain during endotoxemia. J Neurosci 2000; 20: 3456-68. Laflamme N, Soucy G, Rivest S. Circulating cell wall components derived from gram-negative, not gram-positive, bacteria cause a profound induction of the gene-encoding Toll-like receptor 2 in the CNS. J Neurochem 2001; 79: 648-57. Lacroix S, Feinstein D, Rivest S. The bacterial endotoxin lipopolysaccharide has the ability to target the brain in upregulating its membrane CD14 receptor within specific cellular populations. Brain Pathol 1998; 8: 625-40. Vallieres L, Rivest S. Regulation of the genes encoding interleukin-6, its receptor, and gp130 in the rat brain in response to the immune activator lipopolysaccharide and the proinflammatory cytokine interleukin-1beta. J Neurochem 1997; 69: 1668-83. Blatteis CM, Bealer SL, Hunter WS, Llanos QJ, Ahokas RA, Mashburn TA, Jr. Suppression of fever after lesions of the anteroventral third ventricle in guinea pigs. Brain Res Bull 1983; 11: 519-26. Blatteis CM, Hales JR, McKinley MJ, Fawcett AA. Role of the anteroventral third ventricle region in fever in sheep. Can J Physiol Pharmacol 1987; 65: 1255-60. Chai Z, Gatti S, Toniatti C, Poli V, Bartfai T. Interleukin (IL)-6 gene expression in the central nervous system is necessary for fever response to lipopolysaccharide or IL-1 beta: a study on IL-6-deficient mice. J Exp Med 1996; 183: 311-6. Xin L, Blatteis CM. Blockade by interleukin-1 receptor antagonist of IL-1 beta-induced neuronal activity in guinea pig preoptic area slices. Brain Res 1992; 569: 348-52. Ericsson A, Kovacs KJ, Sawchenko PE. A functional anatomical analysis of central pathways subserving the effects of interleukin-1 on stress-related neuroendocrine neurons. J Neurosci 1994; 14: 897-913. Lee HY, Whiteside MB, Herkenham M. Area postrema removal abolishes stimulatory effects of intravenous interleukin-1beta on hypothalamic-pituitary-adrenal axis activity and c-fos mRNA in the hypothalamic paraventricular nucleus. Brain Res Bull 1998; 46: 495-503. Lyson K, McCann SM. Involvement of arachidonic acid cascade pathways in interleukin-6-stimulated corticotropin-releasing factor release in vitro. Neuroendocrinology 1992; 55: 708-13. Rivest S. Molecular insights on the cerebral innate immune system. Brain Behav Immun 2003; 17: 13-9. Lossinsky AS, Shivers RR. Structural pathways for macromolecular and cellular transport across the blood-brain barrier during inflammatory conditions. Review. Histol Histopathol 2004; 19: 535-64. Ivanov AI, Pero RS, Scheck AC, Romanovsky AA. Prostaglandin E(2)-synthesizing enzymes in fever: differential transcriptional regulation. Am J Physiol Regul Integr Comp Physiol 2002; 283: R1104-17. Ivanov AI, Romanovsky AA. Prostaglandin E2 as a mediator of fever: synthesis and catabolism. Front Biosci 2004; 9: 1977-93. Claveau D, Sirinyan M, Guay J, et al. Microsomal prostaglandin E synthase-1 is a major terminal synthase that is selectively up-regulated during cyclooxygenase-2-dependent prostaglandin E2 production in the rat adjuvant-induced arthritis model. J Immunol 2003; 170: 4738-44. Tanioka T, Nakatani Y, Semmyo N, Murakami M, Kudo I. Molecular identification of cytosolic prostaglandin E2 synthase that is functionally coupled with cyclooxygenase-1 in immediate prostaglandin E2 biosynthesis. J Biol Chem 2000; 275: 32775-82. Murakami M, Nakatani Y, Tanioka T, Kudo I. Prostaglandin E synthase. Prostaglandins Other Lipid Mediat 2002; 68-69: 383-99. Kamei D, Yamakawa K, Takegoshi Y, et al. Reduced pain hypersensitivity and inflammation in mice lacking microsomal prostaglandin e synthase-1. J Biol Chem 2004; 279: 33684-95. Engblom D, Saha S, Engstrom L, Westman M, Audoly LP, Jakobsson PJ, Blomqvist A. Microsomal prostaglandin E synthase-1 is the central switch during immune-induced pyresis. Nat Neurosci 2003; 6: 1137-8. Murakami M, Nakashima K, Kamei D, et al. Cellular prostaglandin E2 production by membrane-bound prostaglandin E synthase-2 via both cyclooxygenases-1 and -2. J Biol Chem 2003; 278: 37937-47. Watanabe Y, Hayaishi O. Quantitative autoradiographic localization of prostaglandin E2 binding sites in monkey diencephalon. J Neurosci 1988; 8: 2003-10. Matsumura K, Watanabe Y, Imai-Matsumura K, Connolly M, Koyama Y, Onoe H. Mapping of prostaglandin E2 binding sites in rat brain using quantitative autoradiography. Brain Res 1992; 581: 292-8. Matsumura K, Watanabe Y, Onoe H, Hayaishi O. High density of prostaglandin E2 binding sites in the anterior wall of the 3rd ventricle: a possible site of its hyperthermic action. Brain Res 1990; 533: 147-51. Batshake B, Nilsson C, Sundelin J. Molecular characterization of the mouse prostanoid EP1 receptor gene. Eur J Biochem 1995; 231: 809-14. Engblom D, Ek M, Ericsson-Dahlstrand A, Blomqvist A. Activation of prostanoid EP(3) and EP(4) receptor mRNA-expressing neurons in the rat parabrachial nucleus by intravenous injection of bacterial wall lipopolysaccharide. J Comp Neurol 2001; 440: 378-86. Zhang J, Rivest S. A functional analysis of EP4 receptor-expressing neurons in mediating the action of prostaglandin E2 within specific nuclei of the brain in response to circulating interleukin-1beta. J Neurochem 2000; 74: 2134-45. Zhang J, Rivest S. Distribution, regulation and colocalization of the genes encoding the EP2- and EP4-PGE2 receptors in the rat brain and neuronal responses to systemic inflammation. Eur J Neurosci 1999; 11: 2651-68. Oka T, Oka K, Scammell TE, et al. Relationship of EP(1-4) prostaglandin receptors with rat hypothalamic cell groups involved in lipopolysaccharide fever responses. J Comp Neurol 2000; 428: 20-32. Oka T, Hori T. EP1-receptor mediation of prostaglandin E2-induced hyperthermia in rats. Am J Physiol 1994; 267: R289-94. Oka T, Oka K, Saper CB. Contrasting effects of E type prostaglandin (EP) receptor agonists on core body temperature in rats. Brain Res 2003; 968: 256-62. Parrott RF, Vellucci SV. Effects of centrally administered prostaglandin EP receptor agonists on febrile and adrenocortical responses in the prepubertal pig. Brain Res Bull 1996; 41: 97-103. Ushikubi F, Segi E, Sugimoto Y, et al. Impaired febrile response in mice lacking the prostaglandin E receptor subtype EP3. Nature 1998; 395: 281-4. Oka T, Oka K, Kobayashi T, et al. Characteristics of thermoregulatory and febrile responses in mice deficient in prostaglandin EP1 and EP3 receptors. J Physiol 2003; 551: 945-54. Lazarus M, Yoshida K, Coppari R, Bass CE, Mochizuki T, Lowell BB, Saper CB. EP3 prostaglandin receptors in the median preoptic nucleus are critical for fever responses. Nat Neurosci 2007; 10: 1131-3. Matsuoka Y, Furuyashiki T, Bito H, et al. Impaired adrenocorticotropic hormone response to bacterial endotoxin in mice deficient in prostaglandin E receptor EP1 and EP3 subtypes. Proc Natl Acad Sci U S A 2003; 100: 4132-7. Rivest S. What is the cellular source of prostaglandins in the brain in response to systemic inflammation? Facts and controversies. Mol Psychiatry 1999; 4: 500-7. Ericsson A, Arias C, Sawchenko PE. Evidence for an intramedullary prostaglandin-dependent mechanism in the activation of stress-related neuroendocrine circuitry by intravenous interleukin-1. J Neurosci 1997; 17: 7166-79. Zhang YH, Lu J, Elmquist JK, Saper CB. Specific roles of cyclooxygenase-1 and cyclooxygenase-2 in lipopolysaccharide-induced fever and Fos expression in rat brain. J Comp Neurol 2003; 463: 3-12. Cao C, Matsumura K, Ozaki M, Watanabe Y. Lipopolysaccharide injected into the cerebral ventricle evokes fever through induction of cyclooxygenase-2 in brain endothelial cells. J Neurosci 1999; 19: 716-25. Matsumura K, Cao C, Ozaki M, Morii H, Nakadate K, Watanabe Y. Electron microscopic evidence for induction of cyclooxygenase-2 in brain endothelial cells. Ann N Y Acad Sci 1998; 856: 278-80. Matsumura K, Cao C, Ozaki M, Morii H, Nakadate K, Watanabe Y. Brain endothelial cells express cyclooxygenase-2 during lipopolysaccharide-induced fever: light and electron microscopic immunocytochemical studies. J Neurosci 1998; 18: 6279-89. Blais V, Rivest S. Inhibitory action of nitric oxide on circulating tumor necrosis factor-induced NF-kappaB activity and COX-2 transcription in the endothelium of the brain capillaries. J Neuropathol Exp Neurol 2001; 60: 893-905. Quan N, Whiteside M, Herkenham M. Cyclooxygenase 2 mRNA expression in rat brain after peripheral injection of lipopolysaccharide. Brain Res 1998; 802: 189-97. Ek M, Engblom D, Saha S, Blomqvist A, Jakobsson PJ, Ericsson-Dahlstrand A. Inflammatory response: pathway across the blood-brain barrier. Nature 2001; 410: 430-1. Schiltz JC, Sawchenko PE. Signaling the brain in systemic inflammation: the role of perivascular cells. Front Biosci 2003; 8: s1321-9. Schiltz JC, Sawchenko PE. Distinct brain vascular cell types manifest inducible cyclooxygenase expression as a function of the strength and nature of immune insults. J Neurosci 2002; 22: 5606-18. Elmquist JK, Breder CD, Sherin JE, Scammell TE, Hickey WF, Dewitt D, Saper CB. Intravenous lipopolysaccharide induces cyclooxygenase 2-like immunoreactivity in rat brain perivascular microglia and meningeal macrophages. J Comp Neurol 1997; 381: 119-29. Shibuya I, Setiadji SV, Ibrahim N, Harayama N, Maruyama T, Ueta Y, Yamashita H. Involvement of postsynaptic EP4 and presynaptic EP3 receptors in actions of prostaglandin E2 in rat supraoptic neurones. J Neuroendocrinol 2002; 14: 64-72. Bowers G, Cullinan WE, Herman JP. Region-specific regulation of glutamic acid decarboxylase (GAD) mRNA expression in central stress circuits. J Neurosci 1998; 18: 5938-47. Herman JP, Larson BR. Differential regulation of forebrain glutamic acid decarboxylase mRNA expression by aging and stress. Brain Res 2001; 912: 60-6. Herman JP, Tasker JG, Ziegler DR, Cullinan WE. Local circuit regulation of paraventricular nucleus stress integration: glutamate-GABA connections. Pharmacol Biochem Behav 2002; 71: 457-68. Ziegler DR, Cullinan WE, Herman JP. Distribution of vesicular glutamate transporter mRNA in rat hypothalamus. J Comp Neurol 2002; 448: 217-29. Herman JP, Cullinan WE, Ziegler DR, Tasker JG. Role of the paraventricular nucleus microenvironment in stress integration. Eur J Neurosci 2002; 16: 381-5. Herman JP, Renda A, Bodie B. Norepinephrine-gamma-aminobutyric acid (GABA) interaction in limbic stress circuits: effects of reboxetine on GABAergic neurons. Biol Psychiatry 2003; 53: 166-74. Marty V, El Hachmane M, Amedee T. Dual modulation of synaptic transmission in the nucleus tractus solitarius by prostaglandin E2 synthesized downstream of IL-1beta. Eur J Neurosci 2008; 27: 3132-50. Gosselin D, Rivest S. MyD88 signaling in brain endothelial cells is essential for the neuronal activity and glucocorticoid release during systemic inflammation. Mol Psychiatry 2008; 13: 480-97. Serrats J, Schiltz JC, Garcia-Bueno B, van Rooijen N, Reyes TM, Sawchenko PE. Dual roles for perivascular macrophages in immune-to-brain signaling. Neuron; 65: 94-106. Gilroy DW, Lawrence T, Perretti M, Rossi AG. Inflammatory resolution: new opportunities for drug discovery. Nat Rev Drug Discov 2004; 3: 401-16. Gilroy DW, Newson J, Sawmynaden P, Willoughby DA, Croxtall JD. A novel role for phospholipase A2 isoforms in the checkpoint control of acute inflammation. Faseb J 2004; 18: 489-98. Warner TD, Mitchell JA. Cyclooxygenases: new forms, new inhibitors, and lessons from the clinic. Faseb J 2004; 18: 790-804.